Who loves Chardonnay? Apparently many, with a twist on the name to ChardonnYAY, and enough to have a celebratory day! We were to have a tasting here at the store to celebrate this momentous occasion, but alas, it was too close to our spring open house, so we had to cancel. But never fear! I am here to bring your attention to a few of the stellar chardonnay you may see out there in the market, some you have tasted, and some maybe you haven’t! Chardonnay is known as the “winemaker’s grape”, grown all over the world, and totally versatile. You’ll find it in famous wines like champagne, by itself in a sparkling blanc de blanc versions, oaked, unoaked, and even in my own backyard of the Okanagan, you will see it made into ice wine. It’s easy to grow, and for many, easy to like and drink. But, it has suffered over the years, going through the ABC (Anything But Chardonnay) phase, which is still relevant to many. Even for myself, I’ve gone through a roller coaster where I was anything but, all for it, and my pendulum has moved again to…”let’s drink something else”. Unlike my boss who totally digs the big, buttery, full-bodied Chard monsters, I’d prefer to have just a little MLF (malolactic fermentation) with my chardonnay, along with the stainless steel variety, no heavy oak thanks. And those of you who know me, know my love and passion for Italian wines, and although I carry one in the store, I firmly believe Italians should not make chardonnay. And only because with so many native grapes at their fingertips, and the chance to make something special and different, why make chardonnay? It’s a question only they can answer, and with it being the 9th most popular grape grown in Italy, I guess it means something! 2013 Catena Alta Chardonnay – after recently attending a dinner featuring Catena family wines, I must admit I’m a bit biased towards this one. Not the entry level, nor the single vineyard White Stones or White Bones, that are appropriately expensive, but for under $40, this is a solid chardonnay with everything done right: a combination of first, second and third use French oak, some MLF, and wild yeasts, giving this wine huge complexity with aromas and flavours of baked apple, lemon meringue, peach, fig jam and brioche with hints of vanilla crumble and wet stone. All with high acidity to balance it and clean the palate. Awesome, just awesome. 2015 Yalumba Organic Chardonnay – you might remember I just wrote about this ‘oldest family winery in Australia” on my previous blog. They not only have the high end red wines of shiraz and cabernet, but the feminine beauties in their organic line, viognier and chardonnay. Wine drinkers want organic these days, so this just might fit the bill. From their certified organic vineyards of Riverland and Adelaide Plains, the grapes must be in perfect condition before being picked. Natural yeasts again add to further complexity with aromas and flavours of melon, peaches and cream and lemon curd. Great price too, at least here in Alberta! You can find it for about $22! Prefer Chilean? The Torrean de Paredes is fermented in oak, and gives off much more of a tropical note of banana and baked pineapple. Prefer unoaked? The Drouhin St. Veran, which is from the Maconnais region of Burgundy, just before you hit Beaujolais. It is completely done in stainless steel, to keep the fruit character of the chardonnay at the very forefront. Again, under $40! 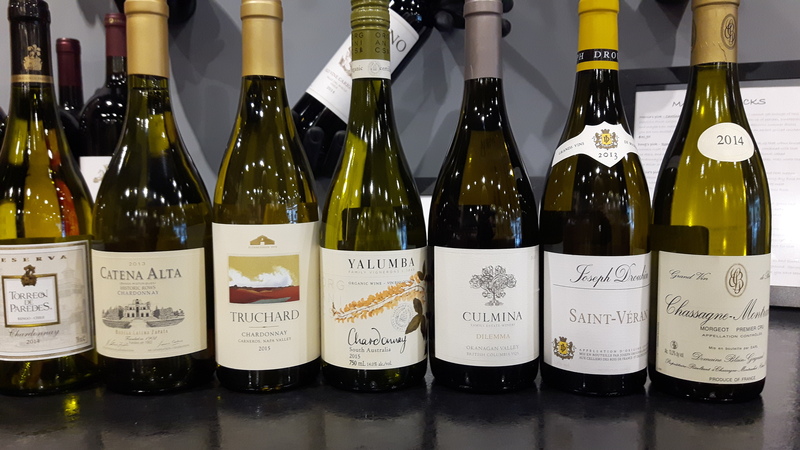 The Canadians have a pretty good handle on this grape, with Culmina winery, on the Golden Mile Bench, producing (in my opinion), one of the best chardonnays not just in the Okanagan, but in Canada also. The Triggs family went to great lengths in soil study, altitude, aspect and degree days to pick just the perfect site for the Margaret’s Bench chardonnay. Called Dilemma, because the choice was made to rip out the original vines and plant them 200m higher, could have indeed caused a great dilemma for the family! Clearly, they chose wisely, as this 2013 Dilemma Chardonnay (although expensive – it’s $57 CAD) exhibits great chardonnay characteristics of stone fruits, hazelnut, vanilla spice, and wet stone, with high, sharp acidity, but rounded mouth feel due to a portion of new French oak being used. Simply fantastic, it might be the best $57 you’ve ever spent. Not to be forgotten, is of course, wine from Napa Valley. The Truchard family is now 2nd generation, with young Anthony III, I’m sure being groomed for the task to come! But he’s a little boy, so there’s time! I recently tasted this wine, and am thrilled that our general public will be able to taste it this Saturday, should they drop by for our annual spring open house. And why not? It’s a beautiful chardonnay, not a big oak bomb that sometimes tends to happen in many Napa chardonnays. Well balanced, using only 33% new oak, various strains of yeast, battonage, and partial MLF. All of this creates a balanced, lovely mouthfilling wine, with harmonious acid to cleanse the palate. Full of pears, baked apples and toasted oak, this is a pleasing chardonnay that I would have no qualms about serving to my guests! The 2015 is on the shelf for about $46. And what would a post about chardonnay be if we didn’t talk of the crème de la crème, the region that perhaps boast some of the best in the world? That would be the Côte D’Or, specifically the Côte de Beaune, where chardonnay reigns supreme in Mersault, Chassagne-Montrachet and Puligny-Montrachet. When I think chardonnay, THIS is the wine and these are the regions I want to drink! No small change though, as these wines can be priced well over $100 or even more! The 2014 Domaine Blain-Gagnard Morgeot Premier Cru is no exception. Priced here at $114, it is stunningly beautiful with lovely integrated oak flavours – about 15% new oak used for the Premier Cru, and a combination of grapes from both older and newer vines. The Morgeot appellation is the largest PC in Chassagne-Montrachet with plantings of both pinot noir and chardonnay. Make sure you drink this with those that will appreciate it! Great substance and texture with linear acidity and flavours of lemon curd, spiced vanilla and hints of coconut and brioche along with subtle wet leaves and mushrooms. Oh so delightful! Happy Chardonnay Day! Drink something great, and tell me about it! Cheers!